As is known, there are many artifacts on the Moon that mankind’s establishment on Earth is not willing to admit. The cover-up over the alien presence is what caused the Apollo missions to be canceled, as the startled astronauts could not be trusted to keep their mouths shut. ZetaTalk Description 4/15/1996: The world watched in rapt attention during the first Apollo Moon landing - a first for mankind. The comments made by the astonished astronauts, who noted signs that they were not the first visitors to the Moon, have generated all manner of speculation. What did they see? From the Earth, the surface of the Moon looks placid, unwashed by water and without an atmosphere, nothing moves on the pock marked surface. Up close, however, one would discover dust covered litter and tracks left by vehicles, unmistakable signs that mankind was not the first. Machinery parts, collapsed structures, tie lines, and even a wheel or two here and there, covered by space dust that never washes away, these items look no different from Earth than the dust covered rocks and craters. Per the Zetas, there are three sources for the artifacts found on the Moon – past genetic engineering projects that used the Moon as a lab, Service-to-Self aliens on the Dark Side of the Moon who are forced by their masters to remain in 3rd density during their mission on Earth, and the Annunaki who used the Moon as an outpost to boost communications between the Earth and Mars. ZetaTalk Explanation 12/15/1995: Currently it is a home for those in the Service-to-Self, who reside there in 3rd Density. However, their home is not what has humans talking, as they are placed on what is called the dark side of the Moon, never visible from Earth. During the era when the hominoid visitors from Planet X were running mining operations on the Earth, primarily for gold, they used the Moon as a communication outpost, as it was free of cloud cover and allowed for a more precise aim through space. However, earlier still the Moon was used as an outpost by groups conducting genetic engineering operations on Earth, as many of these groups found the Earth to be a virtual swamp of life - murky, unpredictable, crawling with bugs and germs, and subject to erratic weather extremes. Their scientists had their specimens brought to the lab for detail work, and returned the fertilized ova for implantation. Thus, the structures seen on the Moon are ancient, and are a combination of the shards of Moon cities from genetic engineering operations and the shards of communication crystals - abandoned and idle but causing quite a stir among humans these days. Evidence of Annunaki on the Moon in the past was presented by NASA in 2009, when a statue reminiscent of ancient Sumerian artwork was found embedded in a Moon rock estimated to be 200,000 years old. A noted scientist has just produced proof that the lunar surface was inhabited by intelligent life: a 10-inch angel sculpture embedded in a moon rock. Geologist Dr. Morris Charles revealed last week that NASA lab workers chipped the angel from one of the rocks brought to Earth by Apollo 11 astronauts 40 years ago, in 1969. Dr. Charles was a NASA scientist himself for 23 years but left the agency in 1987. He still maintains close ties to many of his former colleagues. The angel - a humanoid female with wing-like appendages on her back and long flowing hair - is made of an iron compound found exclusively in the highlands of the moon. This rules out the possibility that it was dropped by a race of aliens from another planet. It's been hand polished to a silvery metallic sheen. Based on chemical analysis of the metal, geologists estimate the sculpture to be 200,000 years old which means it was made 170,000 years before the human species appeared on Earth. The Sumerians told stories of the Annunaki, winged deities, as far back as 18th century BC. 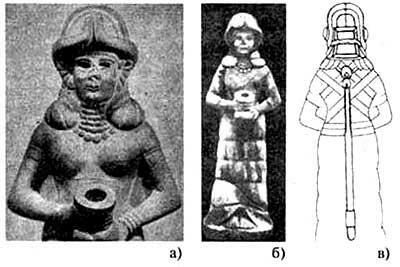 Zecharia Sitchin has already shown in The Twelfth Planet that the statues of gods and goddesses from Sumer present special helmets with protuberances on both sides. Many drawings on the Sumerian plates show the gods with wings, which were not belonging to the body, but they were accessories of the flight suit, therefore the gods looked like eagle. Now we have yet more evidence in a ring of statues across the middle of the Moon. These Moon Men statues are large, of a man with outstretched arms and legs in a strong stance. Given the brag ado nature of the Annunaki, this looks like their handiwork. 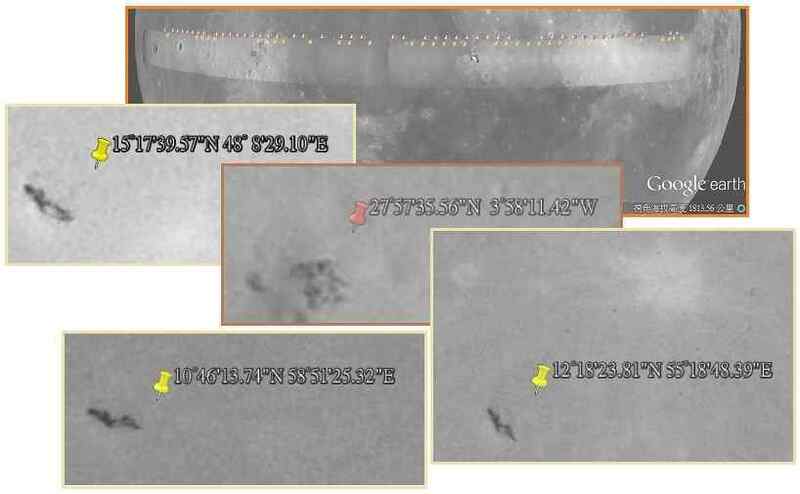 YouTube user Wowforreeel first started investigating the figure using Google Moon, a collection of millions of NASA images made public. Some media sites are pointing to the figure's alleged resemblance to the ancient Greek statue, "The Colossus of Rhodes," which is thought to have sunk into a harbor after a massive earthquake in 226 B.C. Here's what the statue looked like. 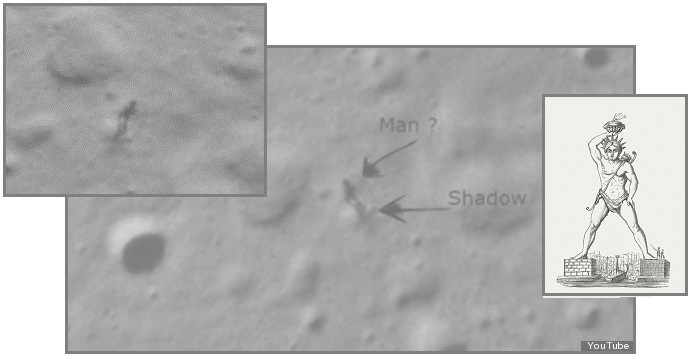 The 'Man' on the Moon? ZetaTalk Explanation 8/16/2014: Which of the prior groups using the Moon as an outpost created the standing man statue? We have mentioned genetic engineering projects on the Moon, the Moon as a lab free from the large predators and swamps on Earth, but being 4th density aliens in the Service-to-Other, such a grandiose display seems inappropriate. We mentioned Service-to-Self aliens living on the Dark Side of the Moon at present, operating in the 3rd density, but they are trying to comply with the Council of Worlds requirement to maintain an Element of Doubt among mankind. This leaves the Annunaki, who were prone to grandiose displays and were indeed on the Moon in the past erecting large crystal communication devices. This is a marker, of theirs. 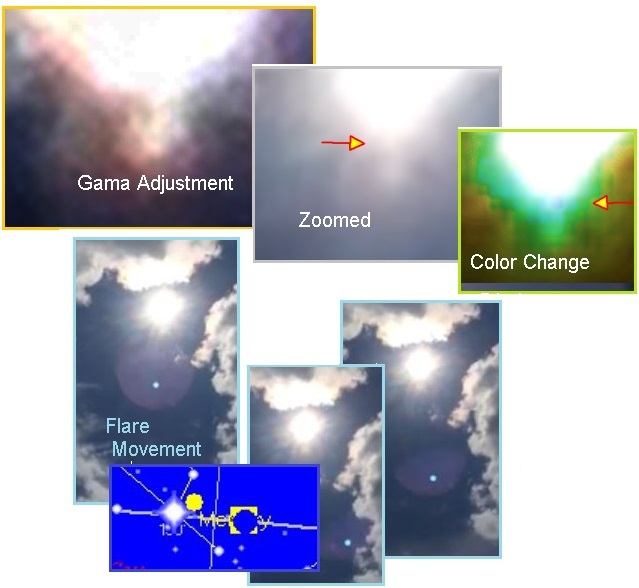 In an unfiltered video on August 15, 2014, a Pole Shift ning member in Austria captured part of the Planet X complex at the 6 o’clock position just below the Sun. Another orb can be seen at the 5 o’clock position. Both show shadows where the sunlight reflects more keenly on the top side of the dust shrouded orbs. The photographer took care to eliminate and identify any lens flares by moving the camera, as can be seen by the movement of the blue dot. The other two orbs do not move. They are not flares. 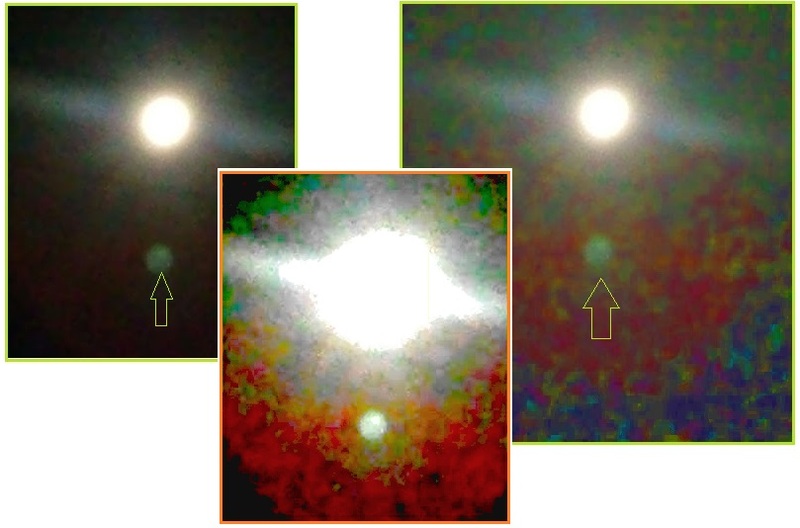 Further analysis of the video with color and gama adjustments shows the orb at 6 o’clock to be a distinct object. 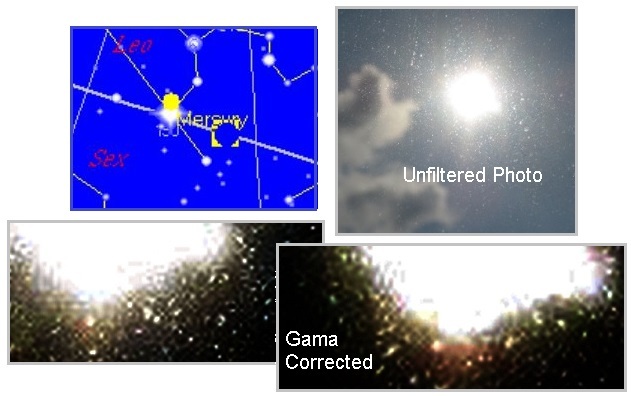 The video was taken at 13:40 CET, just past noon, so the slant of the Ecliptic would have placed the normal 4 o’clock position of Planet X closer to the 6 o’clock position in the camera view. It is highly likely that the orb at 6 o’clock is the corpus of Planet X! A photo taken in Ontario, Canada, also on August 15, 2014, confirms the orb location. This photo was likewise taken in the afternoon, at 3:30 pm, when the Ecliptic was likewise slanted from upper left to lower right. Another unfiltered photo - taken at sunset in Laguna Beach on August 11, 2014 on an iPhone - shows Planet X as a Monster Persona where expected, at the 4 o’clock position. When desaturated, the photo shows numerous orbs to the left and above the Sun too, where Moon Swirls are found as the tail is blown to the left and curls up above the Sun. Another photo taken in California in August using only a Sun filter to reduce the overall glare shows the orb at the 6 o’clock position, centered in a red dust cloud. Note once again sunlight reflected off the top of Planet X, which rides between the Earth and the Sun at present, slightly below the Ecliptic. And yet another from Indiana at sunrise on August 19, 2014. The orb is clearly visible at 3 o’clock. When one checks the location of the Ecliptic, it is clear that the 3 o'clock location equates to a 4-5 o'clock position vs a vs the Sun for the orb. There is no question, this visibility has taken a giant leap forward lately! 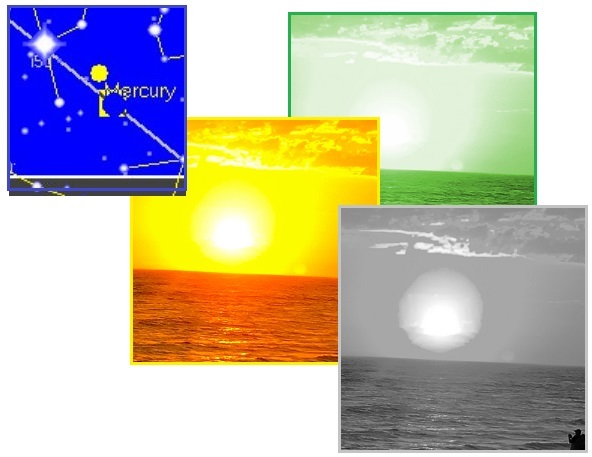 Someone has noted that the size of the orb is smaller than at first glance, as it is within a dust cloud, and this can be discerned with hue adjustments. Tinkering with filters might give a sort of impression of the ratio of size of the core and its surrounding near dust cloud, the larger parts of the tail probably not visible in this take. The quality of crop circle frauds has improved over the years. Those hoping to confuse the public, to deny the alien presence, poured money into crop circle hoaxes so they were larger, more crisp and precise – trying to challenge the best work of the legitimate circle makers. ZetaTalk Comment 8/5/2004: Hoaxes lack the characteristics of legitimate circles which are crop bend at the growth nodes, not broken, and crop laid in different directions overlaying each other, and precision in line and curve. What is to be learned from the hoax circles? They take the symbolism of legitimate circles and distort them, not unlike the disinformation distortion given our words. Legitimate circles do not include faces, as in a prior year hoax of the face of a Zeta or Art Bell, not mazes interpreted to be binary or other code. Hoaxes hope to grab public attention by such gimmicks, and when revealed as hoaxes, cast aspersions on all circles. Legitimate circles have a resonance with other legitimate circles, like the cadences of a symphony, all building upon one another. But one thing the frauds cannot achieve is the means by which the grain is flattered or swirled. The legitimate circle makers use a growth hormone, a ray directed at the nodes, so that one side or the other suddenly, almost instantaneously, grows faster than the other, thus causing the grain to bend at the node. Man cannot do this. The plants inside crop circles are changed in a way that is beyond human ability. Figure 1 above is a photograph showing a normal plant stem and a stem found bent in a crop formation. The bent node of the plant from inside a crop formation is elongated yet undamaged. Plant stems bent by people via mechanical means appear damaged and do not have the elongated nodes. 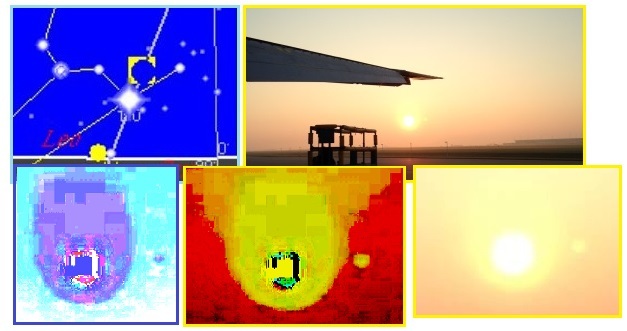 Figures 2 and 3 above are photographs demonstrating the microscopic changes in a plant inside a crop circle compared to a control sample taken from the same field. ZetaTalk Insight 7/15/1997: Crop circles are made by a ray which incites a growth hormone in the crop, combined with wind action caused by changes in the air over the spot to be swirled. Particle movement is not incited simply by the press of electrons. In man's world, heat, light, and electrons seem to go together, but those seeing crop circles laid down have not reported that either heat or light are a necessary component. 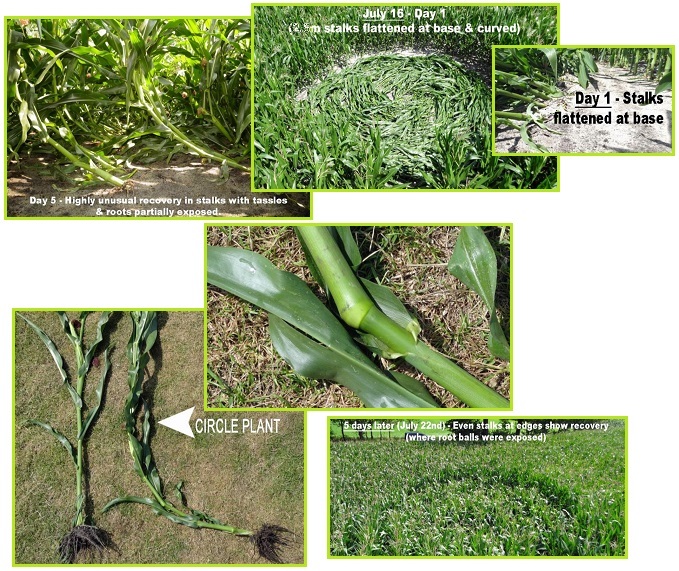 Now unusual scientific attention to a circle in a corn field in the Netherlands has highlighted this growth stimulation. Given a nudge by spirit guides, these scientists were led to a field where a small circle had been laid down. The corn grew upright again within days, and there were other indications that the legitimate circle makers had done the deed. From someone who lives in corn country, I, Nancy, can attest that corn simply does not do this! As usual, this remarkable proof has not hit mainstream media. Though they no longer feature the two drunken dudes with boards, they still are not admitting all the facts. According to Canadian Agronomist and Crop Consultant Mervyn Erb (Agri-Solve Inc.) and retired University of Wisconsin at River Falls Professor of Agronomy & Plant Sciences, Dr. Lou Greub, the curvature of the stalks in this Dutch circle on Day 1 and the fact that the plants (particularly those along the edges of the circle and in its center) were flattened at their bases - with many of their roots exposed - makes the reorientation of the plants at all, and particularly in only 3 days, difficult to attribute to phototropism (the natural response of healthy plants to grow upward toward the source of light) alone. Also, the maize had reached the pollination stage, when vertical growth stops so the plants’ energy can be directed into the development of the cobs. Unlike in the past when UFOs were only a subject of discussion on the Internet or various UFO forums, dismissed by the major media as swamp gas or mass hallucination, UFOs are suddenly a subject making headlines. 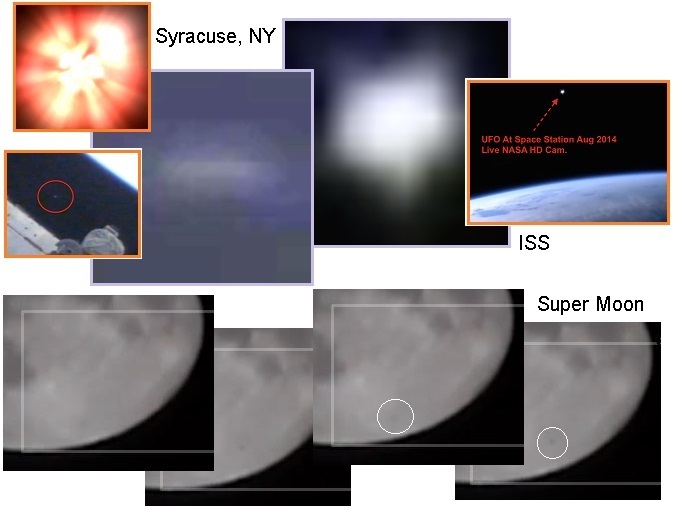 The Moon Man is on Huff Pro, UFOs imaged from the ISS on CNN – what’s going on? Are we about to hear an admission that extraterrestrial life has been visiting Earth for eons, and is with us now? Is disclosure around the corner? The Moon was visible in the night sky closest to the Earth, and this happens once in 20 years. It is called the Super Moon. The phenomenon which was the biggest of its kind took place in July 2014. An amateur videographer captured the Super Moon. Shockingly, the footage also captured an object crossing the path of the Moon. Viewers called the mysterious object as a bizarre UFO. The likely alien craft was seen flashing across the night sky when the enthusiastic stargazer captured the video. He uploaded the video on his YouTube channel. His username is mediabyjj. NASA deployed live webcams on the International Space Station in March, and UFO enthusiasts monitoring their live feeds online have nabbed unidentified flying objects scooting through Earth's orbit. UFOlogist Scott Waring may have been the first, when he plastered them onto his blog, UFO Sightings Daily, early last week. Saturday, 26 July 2014, was a relatively clear night, perhaps that why so many folks witnessed the New York Lights. The pattern of fireball sightings covered a flight path spanning from Long Island, NY to Ontario, Canada. The financial consortium formed in 2006 by Brazil, Russia, India, China and South Africa (BRICS) is challenging the International Monetary Fund (IMF) these days. The IMF is dominated by Europe and the US, i.e. western capitalist interests, which also dominate the exchange rate as a more commonly used commodity, though this has been eroding of late. EU countries are increasingly faced with bankruptcy, and the US is in essence a bankrupt country, struggling with an immense debt load. What is the competition between the IMF and BRICS all about? BRICS is the acronym for an association of five major emerging national economies: Brazil, Russia, India, China, and South Africa. As of 2014, the five BRICS countries represent almost 3 billion people which is 40% of the world population. As of 2014, the BRICS nations represented 18 percent of the world economy. In April 2014, Russian Ambassador at Large Vadim Lukov remarked that the dollar may be replaced by the ruble and other national currencies of the BRICS counties, and that "A large part of the fund goes toward saving the Euro and the national currencies of developed countries. Given that governance of the IMF is in the hands of western powers, there is little hope for assistance from the IMF in case of an emergency. Financial centres around the world function as anchors of trading between a wide range of multiple types of buyers and sellers around the clock, with the exception of weekends. 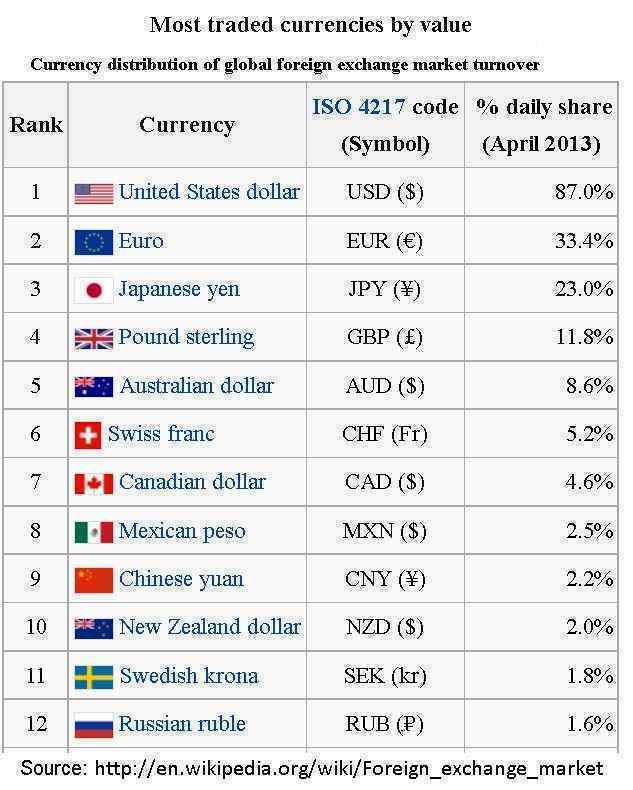 The foreign exchange market determines the relative values of different currencies. If you were following monetary news last month, you may have come across a rattling announcement by Russia’s Deputy Finance Minister, Sergei Storchak. If the BRICS’s demands for more representation at the IMF remain unmet, then the BRICS will create their own anti-crisis fund. In 1944 Edgar Cayce made a prediction about Russia, stating it will be the “hope of the world” bringing “freedom”. Russia subsequently crashed, losing its hold over most of its satellites. What on Earth was Cayce referring to? Per the Zetas, Cayce foresaw the current financial situation, and intuited Russia’s role in a solution. Through Russia comes the hope of the world. Not in respect to what is sometimes termed Communism or Bolshevism – no! But of freedom – true freedom, that each man will live for his fellow man. The principle has been born there. It will take years for it to be crystallized; yet out of Russia comes again the hope of the world. ZetaTalk Insight 8/23/2014: What was Cayce referring to when in 1944 he described Russia as “the hope of the world”. He clarified he was not referring to Communism, though this ideal does espouse the Service-to-Other philosophy, but rather “freedom”. Cayce was referring to the rise and subsequent fall of the West, the grasp of capitalism and colonialism that have emerged from Europe and the US. Where it did reach out beyond its border to create satellite countries, Russia was not a colonial country, imposing imperial will on other countries. This was a European endeavor, over the centuries, primarily a power and land grab from Britain, France, Spain, and Portugal. Britain today still has influence via the Commonwealth in Canada and Australia. Where the US broke free from European control, the European attitudes formed its base. Rich in resources and with a Wild West attitude, America swelled to become the world’s premiere economy, with a peacetime military that surpassed all others in the world combined. Capitalism ruled, the IMF ruled, and the US was granted the right to choose the IMF director as an award. The World Monetary Fund is an obvious extension of this Eurocentric ego. The IMF has an agenda of enslaving poor countries with debt, less interested in development than ownership, a form of financial colonialism. It is now obvious that the dollar’s dominance in financial transactions has slipped, with the Russian ruble and China yuan increasingly replacing the dollar as the currency base. As many European countries border on bankruptcy and the US is certainly bankrupt with China as its largest creditor, the dominance of the West in world financial markets is due to crash. 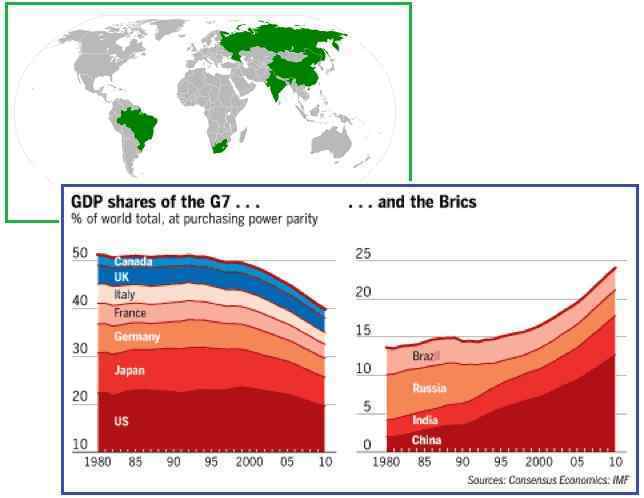 Enter the BRICS.